The Vampire Diaries | Is It Just Me? B.O.B and Somerhalder Secrets: Family Affair What do you do Bob and Dena? Bob and Dena Somerhalder are the charming owners of both Built of Barnwood (B.O.B for short) and the gaming app Somerhalder Secrets. The intrepid and hardworking Somerhalder’s are truly delightful and always have time for the various fans who come up for autographs and pictures at each and every convention they attend. 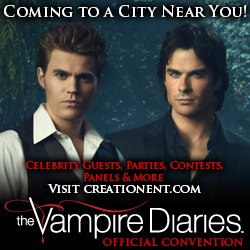 They’ve also created a Facebook group to help fans keep up with their various con appearances. Contrary to popular belief there isn’t a huge company behind anything the are associated with, Bob actually creates each of his pieces himself, with Dena’s help of course. It’s refreshing to see that they don’t just put their name on a product or use the popularity of other family members to create sales. Bob and Dena are genuine and have created products they are proud to sell. Built of Barnwood is based in the charming coastal town of Bay St Louis, Mississippi. Bob Somerhalder’s focus is on reclaiming, recycling, and repurposing vintage wood and building materials. Once reclaimed, the wood is handcrafted into home decor, furnishings, and design accent pieces. Bob strives for a greener, more sustainable economy. With this green desire in mind, the Somerhalders have launched a clean and sustainable business of contemporary products with a vintage flare. Their newest creation is the gaming app Somerhalder Secrets – Raised on the Bayou which is a highly addictive tile-matching puzzle game with a twist, after you successfully complete challenges you will receive secrets about the family, and these are little known facts provided by all the Somerhalder siblings, yes including the aforementioned screen actor. This game features sea creatures commonly found in the Somerhalder’s native home of the Louisiana bayou. The app is available for purchase on the iTunes and GooglePlay stores now. What Do You Do Nicole? When I started helping to promote Thunder Road I never expected to meet as many amazing people who have been moved to aid this campaign after being inspired by the actions of Astoria Entertainment: Charlie Bewley, Matt Dallas & Steven Grayhm. One of these amazing contributors is Nicole Ross, who kindly shared her experiences of her first convention TVD Dallas and why she is supporting Thunder Road. Having never attended any convention let alone a TVD Convention Nicole was apprehensive when her husband Jason approached her with the idea, she was still reluctant up until the day of the convention. She was concerned about the last-minute scheduling changes but like all of us was pleasantly surprised by the new guests and welcoming atmosphere of the TVD fandom. Favorite aspects of the convention were listening to the panels where the guests discussed not only working on TVD but also their own lives and challenges they have faced. Nicole and her husband Jason were the lucky winners of a dinner with Charlie Bewley in support of Thunder Road that Creation Entertainment so kindly auctioned off at the end of his panel with Todd Williams on Day 1 of the convention. Nicole was motivated to bid on the auction after hearing Charlie speak about Thunder Road’s mission to help raise awareness of PTSD and the overall struggles faced by Veterans when trying to reintegrate themselves into civilian life. As the owner and clinic director of The Creative Therapy Center Nicole’s practice focuses on dealing with PTSD. NIcole has over 13 years of experience as a mental health therapist and employs a variety of therapeutic techniques to work with trauma such as Play Therapy, sand tray therapy, and Somatic Experiencing at the center. The center focuses on working with children who have PTSD and other mental health disorders. “Play therapy is an opportunity for an individual to use play techniques to address difficult mental health issues. Play therapy can be adapted to work with all age groups from small children to adults. I use a non-directive play therapy model with children ages 2 – 12, a directive play therapy approach with children struggling with cognitive skills, and sand tray therapy with adolescents and adults.” explains Nicole “Anyone can benefit from play therapy techniques. Even when I am having a difficult day or looking for some clarity I will enter my sand tray room and create a sand tray. So much information can be gathered through unspoken words, metaphors, and ideas. The journey is in the hands of the client. It is their story to tell, and it is my job to be present to hear and honor their story.” Nicole also travels around the United States presenting on trauma, the effects of trauma, and how we can all work to prevent, reduce, and treat trauma symptoms. Inspired by her personal work with PTSD to aid the campaign; Nicole and her husband Jason have been diligently fundraising for the campaign. They teamed up with Modify Tattoo and raised $1000, they also held a drink tab night at The Other Bar in Foley MN where they raised $300 and gave away a $100 gift card that was won by a lucky Veteran. Jason and Nicole have also created a wonderful fundraiser in support of Thunder Road. On September 22, 2013 Jason will be “Breaking Boards for PTSD” with all proceeds going to the Thunder Road campaign. For more about Nicole’s work visit The Creative Therapy Center’s FB page: https://www.facebook.com/CreativeTherapyCenter and for more about Nicole visit her blog. You can also donate directly to Thunder Road on Indiegogo.